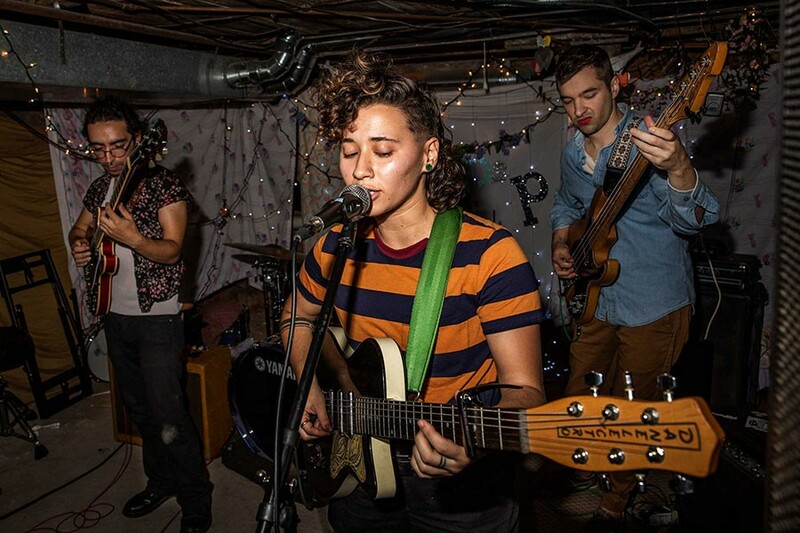 AllegrA’s latest record was written in a weekend sometime in November of 2017, during three days spent alone in a dark, cold basement with headphones strapped to their head. But there’s not much cold or dark about the resulting record, yet, not enough. Instead, the EP feels like a conversation with a dear friend you haven’t seen in months, the kind that lasts for hours but flies by until you realize it’s nearly sunrise and you’ve chatted through the night. The first song on the EP, “Spoon Or Fork,” sets the tone for this intimacy as Allegra Eidinger, the songwriter behind AllegrA, offers to help you decorate your room and eat Chinese food on the floor of your new apartment, turning a foreign space into your home. “It kind of fell out of me, in a way,” says Eidinger of the EP, and that’s the root of the organic feeling that comes across brilliantly on the record. But it’s incredible that such an intimate, natural release can also boast such incredible guitar tone, riffs, and perfectly crafted melodies. yet, not enough exudes the warmth of watching a band in someone’s living room while harnessing the kind of production and songcrafting that sounds incredible in a venue designed for 500, too. The songs feel vulnerable and relatable, as they are born from Eidinger’s day-to-day life. “I think my music tends to flow best when I’m having intense feelings about and experiences with human connection and communication,” Eidinger explains. AllegrA is a four-piece Philadelphia-based band, but Eidinger is closely tied to our city from their time spent going to college in Pittsburgh. During their time in the city, they cultivated a close following of friends and fans, enamored by their twinkly, emo-tinged tracks that overflow with catchy bass hooks and incredibly honest lyrics, not to mention Eidinger’s natural charisma and friendly energy on and off stage. Since Eidinger has left Pittsburgh, they’ve had some very exciting adventures, including touring with Kississippi and Adult Mom in addition to touring their own project. The Kississippi tours took Eidinger to SXSW and on a national tour opening for Dashboard Confessional. Eidinger’s time as lead guitarist in Adult Mom has given them the opportunity to show younger people, especially non-men and other queer folks, that they too could pursue music on the welcoming platform Steph Knipe of Adult Mom has created. “All of these experiences, including two AllegrA tours last year, have taught me so much about the nature of performance, stage presence, professionalism, and how to navigate being a touring musician while remaining grounded by my home base in Philly,” says Eidinger. While Philly has given Eidinger a great community and home base, never fear — the love for Pittsburgh still flows. They also have some serious recommendations for those who still live in the city.